Lady Rowena was born into the Saxon bloodline and had an arranged marriage to Ivanhoe, who she grew to love very deeply. She however soon realized that she was set up because of the power she held and Ivanhoe’s real love affair was with Genevieve. Therefore Lady Rowena felt betrayal and fearful for her life, so she called upon her priest to ask for help and her priest said “it is for you Lady Rowena, to call upon Master Jesus to give you strength”. She did this pleading for compassion because she loved Ivanhoe and Genevieve so much. She asked for forgiveness and this was bought to her by the Holy Spirit. So her heart was filled with the Love of the Christ consciousness bringing her peace. She lived the rest of her life with compassion and forgiveness to all things and especially herself. You can call on Lady Rowena, to bring gentleness and harmony on the spiritual path. She is in constant prayer and she asks for you to pray with her for a situation for yourself, others or the world. The biggest commitment she can bring is self-forgiveness for all situations and forgiveness to others with compassion. 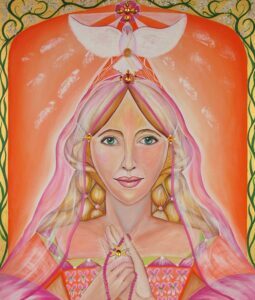 The painting of Lady Rowena shows the dove bringing the Holy Spirit of Mother – Father – God, carrying peach agate to heal with infinite Love. Lady Rowena is surrounded by a veil of Love. She is holding the rosary of the Maltese Cross and saying in prayer the rosary for the world. 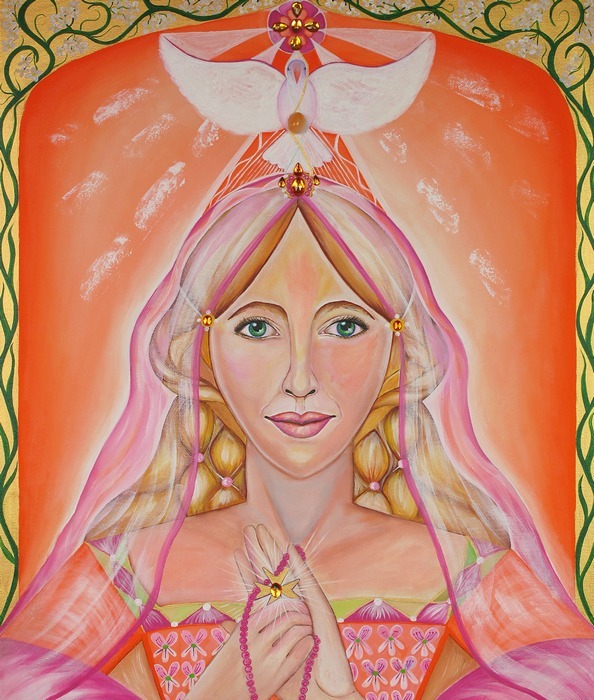 Lady Rowena is very soft, gentle, but the power of Love resides within her spirit and is there for all of us to connect too.